Portable Folding Step from HealthyKin.com add 4" to your step. Use it around the house or to help get in and out of your car. It folds down to 1" and features an easy grip handle. 15.75" x 11" x 4"
My elderly Mom can't get up into SUV's or buses anymore - the steps are too high. I got this stool for her, and she can carry it easily to the vehicle. She hands it to the driver, who expands it, and then she can step right up. She said it has made getting to and from so much easier. By using the portable folding step that decreases the depth of the stair going out to my garage the pain in my knee has been eliminated when I step down. It is sturdy and affordable. I love it! I got this folding step to help my elderly mom get into my compact SUV. Unfortunately, the step is not tall enough. I think she still needs another 2-3 inches as she is only about 5'2. She still has a great deal of trouble getting into my car and gets very frustrated. I like how compact this folding step is, and I will keep it because in an emergency when we have to use my car instead of my mom's car, it is better than nothing. However, I wish it was a few inches higher. 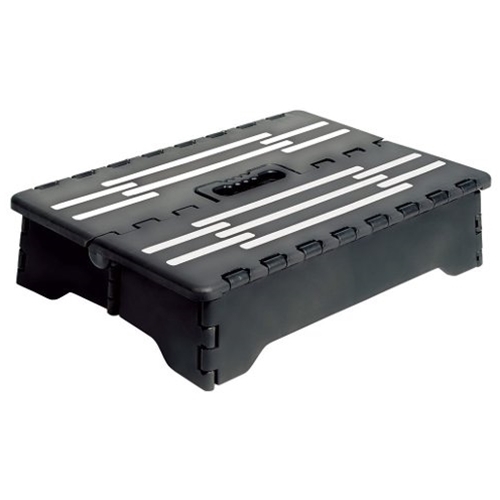 This portable step seems sturdy and is a good height. However, for my specific purpose it did not work out the way I wanted it to. I bought this step for my 83-year-old dad to help him get into my Toyota 4Runner more easily, and it is not large enough for him. He is a tall man with large feet, and the surface area for him is too small. He doesn't feel secure enough to step up onto it with both feet and then turn around in order to sit on the car seat. Secure step Ordered this for my 96 yr young Mom. She needed something to get up into my vehicle. She feels safe using this step. She loves it. Great step! Sturdy and shorter than most stools...Perfect for getting into the SUV or using to level my legs while sitting for long periods of time. Folds in a snap and is easy to transport. Great price that I could get 2, one for the car and one for home. Just remodeled our bathrooms, and installed higher "comfort" toilets. These folding steps also work well as toilet footrest - perfect height, easy to use and stow away. Nice neutral colors, and very reasonable price. Exactly what was needed and perfectly matched description. Fantastic customer service sent out a replacement immediately after being notified that the first shipment arrived damaged and unsuitable for use. Convenient, compact and perfect for Mom getting into car.